A quick guide to 9 famous symbols, history and their meaning. Click on the symbols below or the left hand links. We surround us daily with thousands of famous symbols without thinking about their origin. Some are well recognizable, others more anonymous. Commonly they have a thought, message they want to convey, perhaps a hazard. A great thing with symbols is that they are made to be as simple to understand as possible. Most often, regardless of language, culture and ethnic background. There are various things that one may wish to communicate with a symbol. For example, an emotion, such as the famous symbol "Smiliey Face". Sometimes is the purpose of a symbol to provide identification of a group with special values, perhaps religious or political. By wearing the symbol, you tell others who you are and what you stands for. 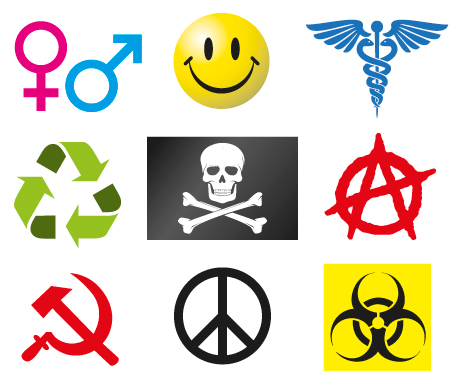 The "Anarchy Symbol" or "Peace Symbol" are such examples examples among the Famous Symbols. Most often, you do not think that either of our famous symbol has its own history to tell, and that they were provided by someone to fulfill a purpose. Sometimes they are even designed with the idea that not disguise anything, as in the case of "Biological Hazard symbol".